It has been suggested that this article or section be merged with Xampp174. (Discuss). Proposed since 5 years ago. This page is tagged because it NEEDS TECHNICAL REVIEW. You can help the Joomla! Documentation Wiki by contributing to it. 4 Download and install Joomla! 4.2 Download files for Joomla! Do more with Joomla! Beyond the basics: doing more Joomla! It is very useful to be able to learn and experiment on your own machine. The aim of this document is to help you to download a sample Joomla! site to your own computer, known as a 'localhost' installation. It has some helpful sample content that allows you to become familiar with the way that a Joomla! site is put together. You can also install an empty copy of Joomla! for creating a new site. You will not panic if you do not understand a concept! Experienced developers and people with programming experience will be fine. If in doubt - follow the instructions and try it! Downloading and installing some software that Joomla! needs to use to run locally, that is to say on your own desktop or laptop computer. This is a web server called Apache, a database called MySQL and a scripting language called PHP. There are a few other things as well - which are downloaded together as one package called XAMPP. Important note on versions of XAMPP - as at March 4th 2011. This section covers installation of the older version 1.7.3. There is a newer version, 1.7.4, which became available the end of January 2011. In the meantime, you can continue to download and use the older version which is reported to be more stable. The point of this to to configure your own machine to behave as if it were a server with the difference being that the result is not visible over the internet and is thus confined to your own computer. This is very useful for learning new things and even developing a new web site. Make sure you have a separate folder for downloads. Download sites for using a Mac or Linux with documentation. Warning: If you are not familiar with downloading software - don't be put off by unfamiliar vocabulary on the download Web site! The site for Windows download. This is a page with links to downloads as well as instructions for installation. A file with the XAMPP logo is saved to the Download folder. In Windows Explorer Details view, the file type will be Application. You may be asked to confirm that you want to run the file - if so - Click Run. The next window gives on-screen instructions. 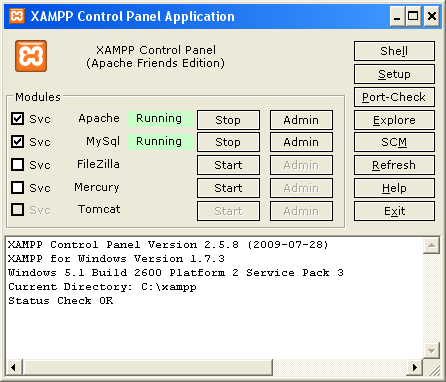 The XAMPP installation screen. Note that it gives on-screen instructions. Installation Progress is indicated on the screen. When the files are extracted, a Windows command screen asks a few questions to configure the installation. Respond to these with the defaults. The files are placed in the correct locations and you are then prompted to press <Return> to continue and to confirm the timezone. Finally the screen presents 7 choices. Double-click the Control Panel icon on the desktop. This is the Control panel with the services running. The Control panel with the services running. The most likely cause is that Apache or mySQL are not running. Use the Control Panel to check these. The VOIP software Skype may in some cases interfere with network settings. If you are using XAMPP or MAMP on a Mac OSX computer which also has Skype installed, ensure that Skype is turned off, then quit and re-start MAMP or XAMPP. If it has been successful - there will be a splash page with a choice of languages. You now see a Welcome page which says 'You have successfully installed XAMPP on this system!'. There are also various links to documentation and other things to the left. You can move on to downloading and installing Joomla! itself. Click the Download button. It links to the latest stable release of Joomla! Click on the ZIP for the Full Package for the latest version. 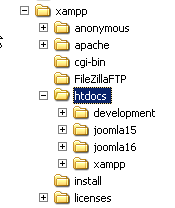 Check that the 'Files will be extracted to this Directory' box has the right folder displayed. The extraction Wizard at work. Make sure the files go to the right folder. Progress is indicated by the blue bar. When completed an Extraction Complete screen displays. The files are now in the right place and you are ready to set Joomla! up for use. If you called the file something else - then use the name of that file instead of 'joomla16'. The Joomla! Installation screen displays. Here you are stepped through seven choices in order to set up the site, the database and a few other things. Your progress is indicated to the left of the screen. 2. Look at the Pre-installation check. There should not be any red items, apart from Display Errors, which can read On. Press Next to continue. The database configuration screen illustrates the layout of the display and shows the answers for the database configuration here. It also illustrates that there is a fair amount of on-screen help. 4. 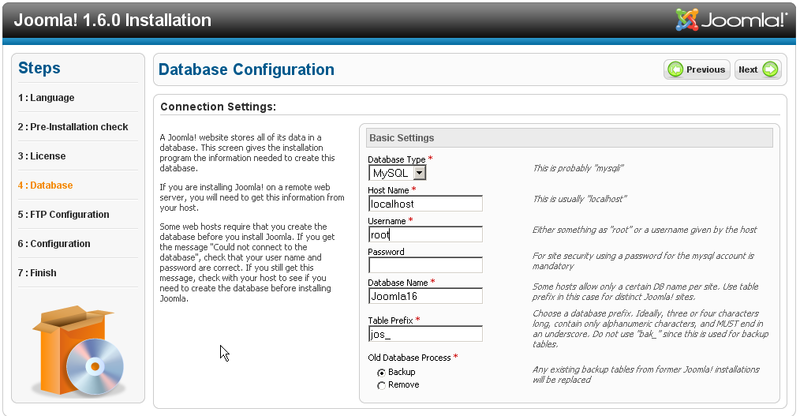 The database configuration page. This sets up and configures the database, where all the content for the site is stored. Set a password for the user name for the database. Use something you will remember! Or leave blank for now - you may need to remove a password entered in this field if you receive an error message when you attempt to connect to the MySQL database in a subsequent installation step. See note in this section below. Database name - this is the name of this instance of Joomla! - in the example here use joomla16. If you used a different name - use that here for the database name. 6. Site name and sample data. Give it a name - such as 'Sample'. Enter a password - and remember this as it lets you use the site! The rubric explains why you need this. There is some information on the side panel about why you should install the sample data. Why install the sample data? It is helpful in showing how a Joomla! site hangs together. You can observe different ways of doing things. 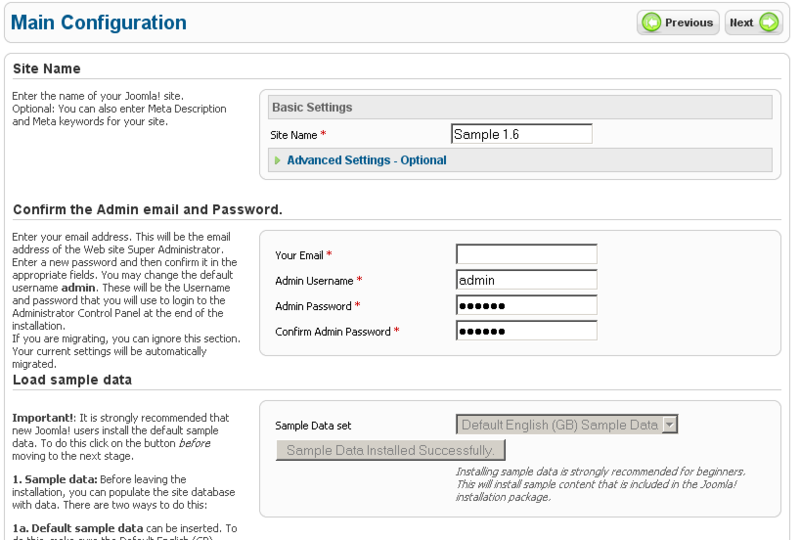 If you want both a site with sample data and a site with no data - you can install another instance of Joomla! on the same computer as explained in the last part of this document. Click the button that says - Install Sample Data. The button will then read 'Sample data installed successfully'. It is slightly confusing as you might expect it to take longer. Sometimes there is a message that the database won't connect. The fix - Click Previous and remove the password. Check that the other settings are the same as you originally entered and then continue. The Finish screen has helpful advice. If you try to go on to use the site without doing this, you will be prompted to do it. You are only allowed to continue when it has been deleted. You can install and configure another instance of Joomla! using a different name. You do need to download it again as you removed the installation directory as a security measure. Extract the files from the Joomla! download in exactly the same way - but Browse for the new folder name. do not enter a password for mySQL root if there is a database error. And - of course - do not install the sample data if you want a clean site. You may want to uninstall Joomla! and XAMPP. If you do this - make sure you have copies of anything you may need, such as configuration files. The easy way - you can use the uninstall script. (It appears on the Details list in Windows Explorer as a MS-DOS Batch File). This opens a command window and asks if you want the htdocs directory deleted. If you choose 'n' - it does not delete the folders \XAMPP\htdocs and \XAMPP\mysql\data - so you will need to do this yourself. The services are then stopped and the control panel removed from the desktop. The next message is that it will delete the files. Your response should be y for uninstalling the package. The installation can be uninstalled by deleting all the files under the \XAMPP\ folder, but there may be errors if you do not stop the services and check that nothing is running first. 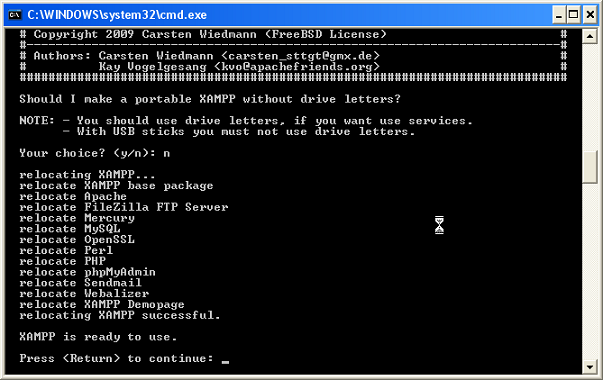 There is also documentation on the XAMPP site about uninstalling. You now have a Joomla! site to work with and some documentation to go with it. Become familiar with Joomla! by altering and adding content. Hands-on editing an article: Joomla! 1.6|Hands-on how to begin to edit an Article. Hands-on adding a new article: Joomla! 1.6|Hands-on how to create a new Article. Using the sample data. There is some documentation on the sample data on the sample website created on localhost. Documentation about installing and using XAMPP. This is the documentation for XAMPP and also has links to help about xampp. This page was last modified on 12 September 2013, at 08:59.